This past weekend we had a booth at a local fair to showcase the Stepcraft product line. Our main objective was to show the product and technology to a general audience of people and see what they thought. Since there is so much versatility in the functionality of what the machines can do, I wanted to see what ideas an average consumer might have if they had access to a CNC system. The feedback was amazing and it gave us a chance to experiment with different name descriptions to help describe what this technology is. For example, saying it is a CNC machine might be a turn off to someone who used to work on CNC back in the day of tape machines or gcode programming. CNC might not mean anything to some people, specifically women who are looking at it for crafty purposes like scrapbooking. This was a good test to not only help us refine our marketing but also to help with the information that we put out on our website and in the podcast. 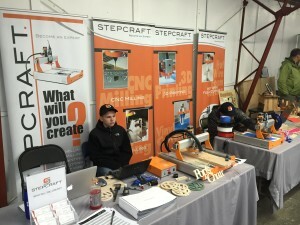 We attended the Harwington Fair in Connecticut last weekend. This is Daniel, my son, looking bored because it was a Saturday and there was no people since it was cold, raining and windy. Sunday, however, we saw 1000’s of people – much nicer day. While at the fair we had a chance to meet an awesome guy, Ryan Aeschlimann, from Ry’s Custom Concepts (https://www.facebook.com/RysCustomConcepts/). 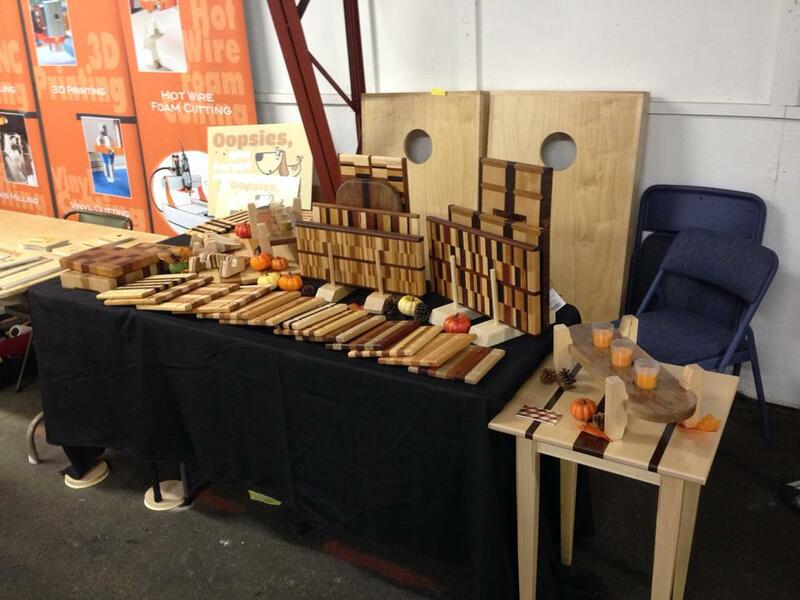 Here was Ryan’s booth at the Harwinton Fair showcasing some of his amazing creations. He hand crafts some of the most amazing hardwood cutting boards, and other creations. He was kind enough to give us a scrap peice to use to carve a design into. This is an example of how a CNC system can take an already amazing product and add personalization to it, in order to expand your market and ad additional profit to your product line. We are hoping to work closer with Ryan in the upcoming weeks to see if we can incorporate CNC with his amazing designs. Please check him out and LIKE his FaceBook Page!